While Victoria’s best golf courses are generally found in Melbourne’s Sandbelt or along the Mornington Peninsula, a new course in Melbourne’s outer west, Eynesbury, is beginning to turn some heads in the social golfing community. The recent host of the Victorian Social Golf Club Championships (VSGCC), Eynesbury’s course and homestead offer an endearing combination of challenging, heart-pounding golf, surrounded by a tranquil Aussie bushland setting. It’s becoming the latest “must-play” course for any social golf calendar. I’ve played Eynesbury a few times now, and each round has offered a different perspective on (and appreciation of) this magnificent course. Whether it’s been warm and sunny, cold and windy, or even in the pounding rain and hail (like during the VSGCC), Eynesbury has shown a different set of challenges and risk-reward options, and it has proven its playability in even the most brutal of weather conditions. The course’s wide fairways (Santa Ana couch) and true greens (G2 bent) provide a great playing surface. If you’re stuck in the bunkers, rivers, rough or various other hazards, however, then you’ll have a fair bit of work to do, as they can be brutal. But that’s half the fun of golf, isn’t it? And while it may seem like a fair distance to travel for a round of golf, at 45-minutes from the CBD it is still closer (for some) than travelling down the Mornington Peninsula. This is an important point for those who can’t wrangle a leave pass for more than a few hours in the day. From a social group / tournament standpoint, Eynesbury is a real winner. With first-class practice facilities, top-notch tournament management, a full fleet of carts and a great set of entertainment/food facilities, it’s sure to help make any event memorable and successful. I simply love this course. Eynesbury is, quite simply, an outstanding golf course. The clubhouse and surrounds are both striking and serene, featuring transformed bluestone buildings built by a mid-18th century pastoralist. The course is a symphony of superb golf holes in a uniquely Australian landscape. 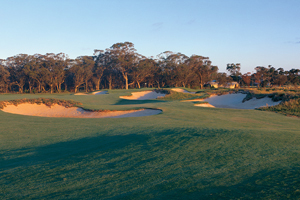 It is a bushlands-style course, punctuated with magnificent eucalypts through gently undulating terrain. Time and again the holes require planning and thoughtful decision-making to navigate the challenges and complexities of the journey and on most holes, the tee shot demands careful consideration of what lies ahead. It starts with two picturesque, manageable par fours, both with slight doglegs to the left, options for how aggressive to play, and very well placed bunkers – something that is a feature of the design. The par-four fourth hole is a brute at well over 430 metres, often into the prevailing wind. A lone gum near the left of the par-five fifth hole seems innocuous as a tee shot that misses left may appear ok, but the options for the second shot can be severely impacted by this lone monolith. The ninth green is superbly framed by a strand of trees 50-or-so metres before the green with a gap through which the target is visible from the fairway. The par-four 13th is a brilliant hole. At just 260 metres, it appears a snack but most golfers walk away shaking their head. It is a hole that can be played with guile or brute force and either option can yield rewards. The smart play is a tee shot of 200-230 metres to the left section of the fairway to open up an easy pitch to the pin. The fun play is to go for it – the green can be reached but the drive needs to clear a creek, thread a needle between bunkers and magoombah and hold onto an elevated putting surface. I have only seen one bloke drive the green – and he three-putted for a par! The only bad word I have heard about the course is that some of the rough near the fairways is severe “cabbage”, but that’s it. Everyone I know who has played there has loved the course and gone back for more. I think Eynesbury is a must-play golf course and arguably the best value public access course near Melbourne. This course has claims on being the best designed, maintained and managed golf course anywhere west of Melbourne. With a new golf course opening up every six minutes, one might ask why you’d take a risk with a sheep paddock in the middle of nowhere. The ground is flat, wind and rainswept, and there are few if no natural features surrounding the course. So what’s the attraction? In a nutshell: the fairways and greens are in great condition and the design makes perfect use of the natural features running across or adjacent to each hole. The first cut of rough is in good nick and playable, but the second cut is club-head grabbing hell. It’s a long, modern track and you have to think your way around it. Case in point – the 18th. There is a creek running diagonally across the fairway. From the white tees you’d need to carry around 210m to hit over the creek on the right hand side and at least 240m to clear it down the left. Why? Well you don’t hit as far with a slice or block right as you would with a power hook left. Depending on which crap shot you choose, you sail centre-guts into a different part of the creek. You could of course choose to lay up short of the creek, hit a fairway wood or rescue club to the front of the green then get up and down for a par, but that’s just crazy talk. I’ve played the course twice – once in early winter and once in late Spring. The late Spring game was brutally cold in high winds and heavy rain. The winter game in calm skies and sunshine. Neither the weather nor the season seemed to affect the condition of the course though, and it was beautifully presented on both days. Suits mainly low to middle handicaps, although the open fairways and generous greens could allow a crafty high handicapper to drop a shot or two if they concede that the standard long-drive-out-mid-iron-in game doesn’t suit some holes. It is always with mixed feelings that you approach any course on a wet, wild and windy day. With a course like Eynesbury, it fills you with even more trepidation as the fairways are tight, and a lush and grasping rough begins what seems to be inches from the short stuff up the middle. A day like the one I played allows you to take in a course from all angles as you twist this way and that to avoid the finger-searching chill of the wind as you wait for your partners to slog through the tempest and complete their shots. Beautifully manicured fairways led merry dances through the curtains of rain, skirting a liberal smattering of fairway bunkers, while a nice number of small water hazards (both streams and ponds) challenge the serious social golfer to attempt lay-ups and take notice of yardage and club selection. Had this not been one of the more frigid days of the year, I would have spent even more time admiring the layout that Graham Marsh had put together. As it was, most of the day was spent desperately attempting to avoid embarrassment as my rusty, increasingly social game was put to the test by both conditions and this challenging course. My advice is that the poorer your golf game, the more appalling the conditions need to be to tackle this tight, rough challenged course. WHAT??!! I hear you cry. For those of us that have limited skills, a benign day presents us with an irresistible opportunity to get into trouble of the worst kind. As our stoutly hit drives follow their hooked or slicing paths through the stratosphere, the hungry rough of Eynesbury licks its many bladed lips and swallows golf balls in the same way I down pots and middies. Foul weather, however, rugs us up, restricts our swings, focuses our games and stops us getting into anywhere near the trouble that a sunny and optimistic day will encourage. All in all a great course for a fine day and a low handicap. From the city, link up with the Western Highway or take the Western Ring Road to the Western Highway turnoff at Deer Park. Turn left at the Werribee (C702) exit, otherwise known as either ‘Hopkins’ or ‘Derrimut’ road, then turn right immediately after the railway line into Greigs road. Travel along Greigs road, veer 90 degrees at Mt Cottrell road, then turn right onto Greigs road west. Continue through the Werribee River and then turn left into Eynesbury road at the top of the hill.